Operation Happy Sock: What the Heck is a Happy Sock? What the Heck is a Happy Sock? A Happy Sock is a catnip toy made from a sock. You can see several examples of Happy Socks in this photo. 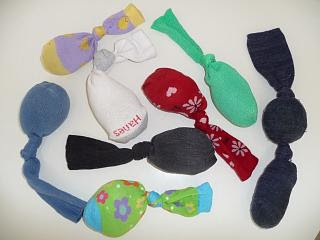 Happy Socks are super simple to make: just take a sock and stuff it with a fistful of polyfill and a big pinch of catnip. Tie a knot in the ankle and you've made a Happy Sock! Happy Socks can be made from almost any kind of sock. And cats love Happy Sock catnip toys because they're big, fluffy and durable. I luf my beans' socks, dirty or clean, an dat's wifout catnip. Maybe sum of my boy's old socks dat are too small can be Happy Socks fur shelter kitties? Nina an I bof comed from shelters an helpin shelter kitties sounds good! Approval, I work in customize socks factory, so my cat can have endless socks toys. Just wanted to drop you a note to say thank you for the great service project idea! My daughter's scout troop recently completed this project (complete with a trip to a local veterinarian who only treats cats), and it was a complete hit with the girls, and especially the cats! It was simple, low-cost, fun and a great way to use up the old socks that *everyone* has around. I'm sure my kitty will love it...she's a catnip addict and I am her dealer. wow dees are so cool, we telling the human right now. Have a purrfect Tuesday! Girl Scouts of the Green and White Mountains - Troop 40669, recently made 100+ Happy Socks as part of their Bridging to Cadette project. We are currently making plans to get them donated. I am happy to email you photos if you would like them. Email me at cfignewton@gonowmail.com. I can't wait to make some. We just had a new Shelter open up across the street. This would be perfect. We make these every summer here at the Enka-Candler Library. The community loves it and so does our local shelter. A great and worthwhile project all around. Just found you through my blog. Love this idea and will share a link to your blog very soon. This is perfect for folks who can't bring themselves to interact directly with the kitties in shelters. Thank you!! Sock Dreams just posted this link on their Facebook page and suggested that their crafty bundle would be perfect for this! I only wonder how long they hold up! The eldest member of the Teenage Mutant Ninja Kitty Horde, Sir Thomas of Snuggle, completely tore apart the only happy sock I've made thus far and took out all of the catnip and started on the stuffing! Of course, I immediately took it away when I saw the hole so that neither he nor the other Horde members ate stuffing! I'm very excited about this project and am off to go post it on our blog!! Wouldnt suprise me if he wins say 17 games or maybe only 10. i feel as if Becket will get the two spot followed by Buchholz and Lackey because Becket has been an ance here for so long and he knows how to win especially in the playoffs. the 5th spot is likely to go to Daisuke Matsusaka but that doesnt mean Wakefield is going to challenge him for that spot. that is to say Daisuke looks great in camp and in shape.